Shipped as 2 x 2lb. containers in one box. Please Note: If you want the best value, including shipping, per bottle. Check out our 32lb (16 x 2lb bottles) and 128 lb (64 x 2 lbs bottles) offerings this will give you a much lower price per bottle for the product delivered to your door. And because we only use high quality HDPE containers, with air tight resealable caps, you can keep the product for as long as you wish in the garage (just make sure the caps are tight). THIS SHIPMENT IS CLASSIFIED AS ORM-D CONSUMER COMMODITY. OUR PACKAGING MEETS ALL APPLICABLE REQUIREMENTS OF THE US DEPARTMENT OF TRANSPORTATION. WE ARE A CERTIFIED SHIPPER AND SEND THIS PRODUCT IN SAFE AND LEGAL PACKAGING BY A LEGAL CARRIER. Soap Making has been going on in peoples’ kitchens, barns, and yards for over 100 years. At GreenerLifeClub.com we wanted to share these 5 great vintage pamphlets from the early 1900’s. Each contains some very interesting facts and usage information about Lye. Enjoy! Click here to view and download Vintage Lye pamphlets. It is vitally important that you use only quality Sodium Hydroxide (Lye) when making soap. Essential Depot’s Sodium Hydroxide (Lye) is manufactured in the U.S.A. by a very large reputable chemical company. The manufacturer’s specification is 96% minimum Sodium Hydroxide strength. 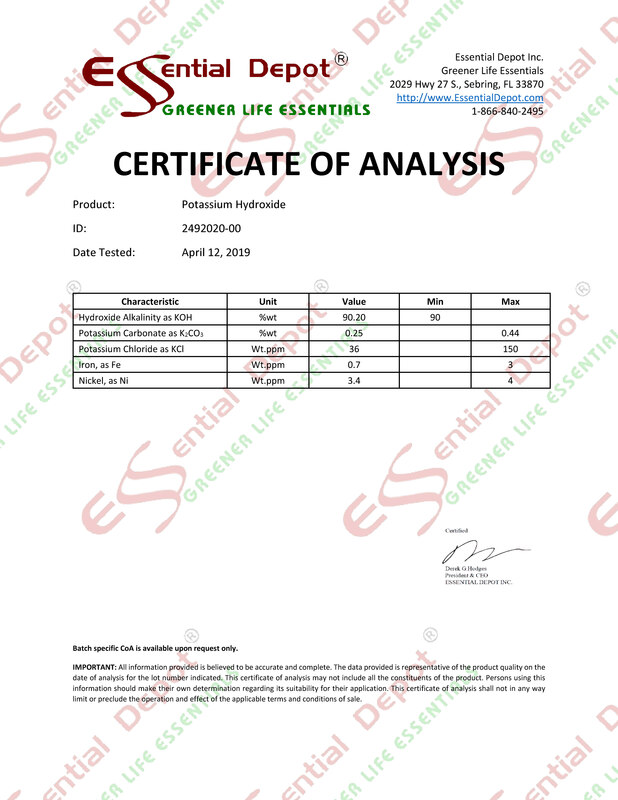 The typical Sodium Hydroxide (NaOH) strength received from the manufacturer by Essential Depot is between 98% and 99.9%. Sodium Hydroxide from China or Mexico can vary by greater percentages. Essential Depot has filled over 100,000 orders from soap makers with its high-quality U.S.A. made Food Grade Sodium Hydroxide (Lye). This has enabled Essential Depot to offer the better quality product at a lower price than its competitors. With much input from our most experienced soapmakers, Essential Depot has been able to identify the many possible causes of the rare bad batch of soap. Click here to review our article "Avoiding Bad Batches" and Click here for our handy Soap Making Troubleshooting Guide.